We used the screens for the first time this Sunday. They really made a difference! Here Priory kitty, Nadia, checks to make sure that all is in order. 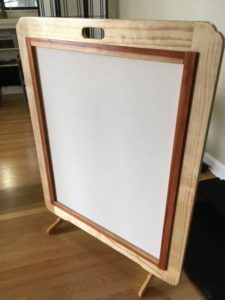 On Saturday, April 13, 2019, Rev. Helen offered Reflections on Mindfulness as part of St. Barnabas Episcopal Church (Mount Shasta). 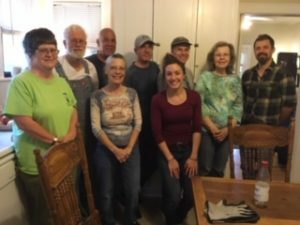 She and Patty Donahue shared lunch with the group of 11 participants including Father Larry Holben, and participated in the times of quiet and prayer. It is a joy to come together with like minded folks to share a time of reflection and quiet sitting. 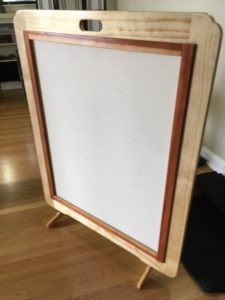 Thanks to Tom Gibson and Maria Domenech Florit who facilitated the creation of two beautiful meditation screens for the Priory Meditation Hall. They are sturdy yet gracefully designed, light and easy to lift. They will allow for more people to sit more comfortably with us. 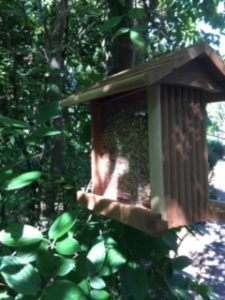 Thanks to Matthew Wiedmann who created these beautiful additions to the Meditation Hall. Eric Matcho and his new orange tabby cat Ernie came by to the Priory for a blessing. Eric and Ernie found each other at Haven Humane Society, and the match couldn’t be better. – they already bring much joy and delight to each other. Pictures soon! Congratulations to Gary Solberg who took the Precepts at Shasta Abbey Tuesday! The Redding contingent was there to celebrate with Gary. 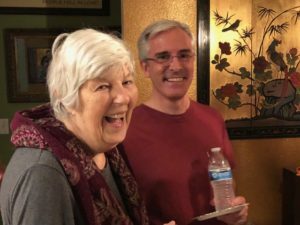 Jeri Shattuck is attending the whole Jukai Retreat, and Patty Donahue, Susan Place and Rev. Helen went up to Mount Shasta for the day to attend the beautiful Lay Ordination Ceremony. Gary was one of 19 people taking the Precepts for the first time. March 24, 2019. We’ve had a full weekend! Happy Spring and Happy Nowruz! On Sunday morning, March 24, Roya Mozafar treated the Priory to traditional treats in celebration of the Persian New Year! 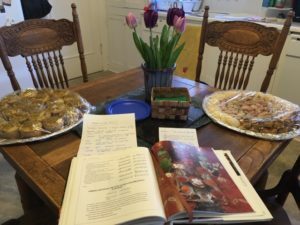 There was an abundance of delicious rice cookies and chick pea cookies, as well as walnut cookies, Persian baklava and delicious rosewater cupcakes. Roya also brought cardamom and strong black tea. Additionally she gave us an overview of Nowruz traditions and the importance of this holiday in the Persian world. Happy Nowruz! 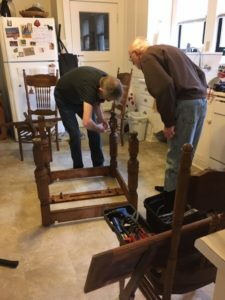 On Saturday afternoon, March 23, 2019, Rev. 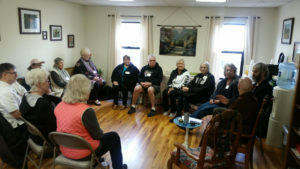 Helen with Chris Carrigan and Patty Donahue, visited with Pastor Tara Macy and members of the Shasta Lake Methodist Church to explore aspects of meditation. 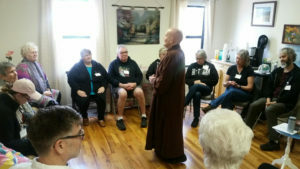 The group was quite interested, asking good questions and enjoying a rich discussion after having the opportunity to have some quiet meditation time. Pastor Tara and Rev. Helen are members of the Shasta County Interfaith Forum. Happy Spring and thanks to all who helped with Saturday’s Working Meditation. It was both enjoyable and productive. The Priory Meditation Hall, kitchen and library benefited from a deep spring cleaning. be alert, to be on the watch for, or to be strong as one keeps watch. “the vigil of daily life” that we’ll step into once we go back out that door. All that we are is the result of what we have thought: We are formed and molded by our thoughts. Those whose minds are shaped by selfish thoughts cause misery when they speak or act. Sorrow rolls over them as the wheels of a cart roll over the tracks of the animals that draw it. Those caught in resentful thoughts never find peace. Those who give up resentful thoughts surely find peace. Hatred ceases by love. This is an unalterable law. There are those that forget that death will come to all. For those who remember, quarrels come to an end. The Buddha spoke these words more than 2,500 years ago. They’re directly relevant today, are they not? is the meaning of tenderness. whilst thinking that one loves all living things as if they were one’s own children. this is all through the power of tenderness. tenderness can have a revolutionary impact upon the mind of man. Eihei Dogen spoke these words in the early 1200s. Can tenderness in 2019have a revolutionary impact upon the mind of man? May we live in such a way that we become the change we wish to see. on our own expressions of body, speech, and mind. find contentment, be peaceful and free of suffering. – meditation, retreats, classes, spiritual guidance, weddings, funerals or memorials. and are responsible for the normals costs of running a household. 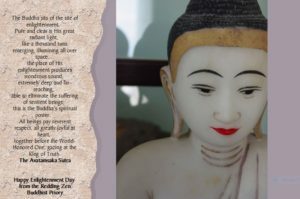 We held the Festival of the Buddha’s Parinirvana on Sunday, February 17. This is our altar for this most solemn occasion in the Buddhist year. Be a lamp onto yourself. Always seek to get back on The Path. Thank you all who participated in Saturday’s Ceremonial Tune-Up. The Priory now has at least 11 new Precentors and Precentor’s Assistants willing to participate in Morning Service and other ceremonial events in those roles. Ceremony is a rich ground of training, and a wonderful offering to the life of the Priory. 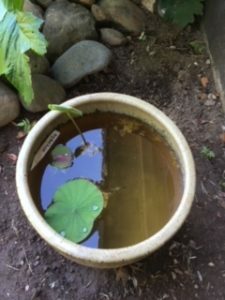 Thanks to Patty Donahue of the Redding Zen Priory and Rev. 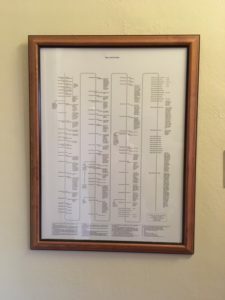 Leon Kackman at the Portland Buddhist Priory, we now have a beautiful chart that details our Ancestral Line hanging just at the entryway to the Meditation Hall at the Priory. Thank you all so much for your participation in the life of the Priory over this long weekend – those who attended Saturday’s day-long retreat on Kanchi Sosan’s beautiful teaching on That Which is Engraved Upon the Heart that Trusts to the Eternal which included a formal lunch eaten together in silence, and those who attended Sunday’s Memorial for our deceased pets and for all animals who have died in distressed circumstances, including the recent California fires. On a rainy Sunday afternoon, January 6, 2019, Rev. Helen was celebrant for Rhiannon and Sisouphanh Xaypanya’s House Blessing, naming the house the Abode of the Awakened Heart. 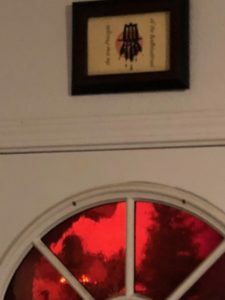 After a lovely ceremony at the family’s beautiful living room altar assisted by daughter Ava, we hung the framed Ketchimiyaku above the front door, and processed through the house chanting the Om Kembaya verse. We then enjoyed the delicious spring rolls and other tasties that were offered. 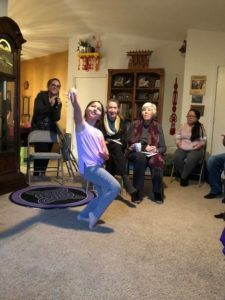 Also, in celebration of the Lu Mien New Year, 8-year old Ava offered a traditional Laotian New Year Dance. 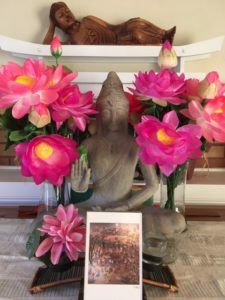 Besides Rhiannon and her husband and children, Redding Zen Sangha members Lindene Anderson, Vickie Wolf, Patty Donahue, Jeannine Gillan, Eric Matcho, Gary Solberg, Chris Carringan, Margaret Rooker and Gwen Rooker shared in this lovely ceremony. 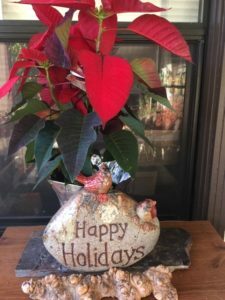 Happy New Year from the Redding Zen Buddhist Priory! This is the dedication I offered at our New Year’s Eve Ceremony: On this New Year’s Eve, we are gathered to offer blessing and merit for all that unfolds in the coming year. May all beings be happy in the face of change. May all beings be peaceful in the face of impermanence. May all beings be free from suffering as we recognize that we are NOT in control as things change around us. 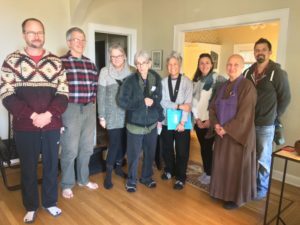 Nineteen of the Priory Sangha came by to celebrate New Year’s Eve with meditation, to recite the Scripture of Great Wisdom as part of our New Year’s Ceremony, and to enjoy festive toasts with Martinelli’s Sparkling Apple and appreciative Sangha conversation. Thanks to Maria Domenech Florit we also observed (and enjoyed!) the Spanish tradition of eating 12 grapes. Thanks to all who have brought the Priory to where it is today. 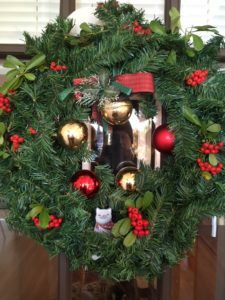 May our practice – and the life of the Priory – deepen in 2019. Thanks to all who participated in our Working Meditation Morning on Saturday, December 8. 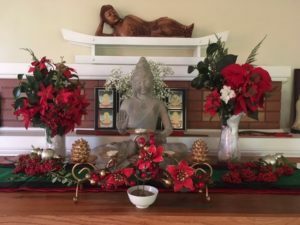 In mostly 91 minutes we decorated the altar and a beautiful “jewel tree” as well as putting up holiday decorations outside and inside the Priory in preparation for the Festival of the Buddha’s Enlightenment that we’ll celebrate on Sunday. 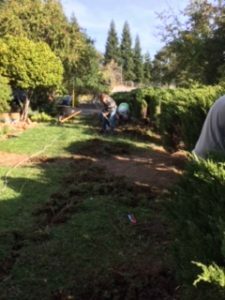 We also continued work on the Redding Zen drought-resistant garden around the side of the house and in back, planting several buckeye trees, a spice tree, and two Japanese maples. At the conclusion of our morning we had a delightful time over tea sharing stories of our respective holiday traditions. 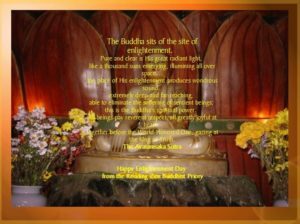 The traditional celebration of the Buddha’s Enlightenment is December 8. 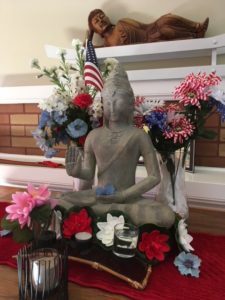 Redding Zen Buddhist Priory will celebrate on Sunday, December 9 with a morning of meditation starting at 7am and the Festival Ceremony at 11am. 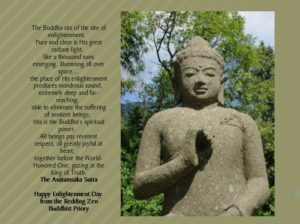 Special thanks to Shonna Smith who created such beautiful Enlightenment Day Email Greeting “cards” that we’ll be sending out. 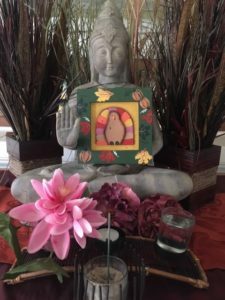 Happy Thanksgiving from the Redding Zen Priory! 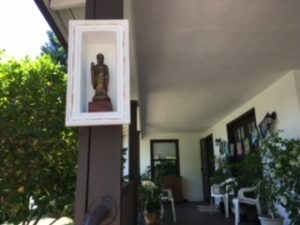 and your on-going support of the Redding Zen Priory. This has been a challenging year for so many of us. May we continue to offer gratitude for the things that matter. 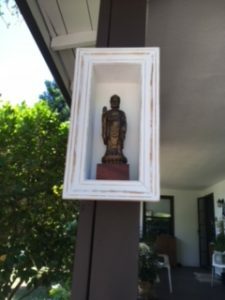 …Because of consideration for others on the part of the Buddhas and Ancestors, we are enabled to see the Buddha even now and hear His teachings: had the Buddhas and Ancestors not truly Transmitted the Truth it could never have been heard at this particular time: even only so much as a short phrase or section of the teaching should be deeply appreciated. which is the very eye and treasury of the Truth? if animals can show gratitude surely man can do the same? 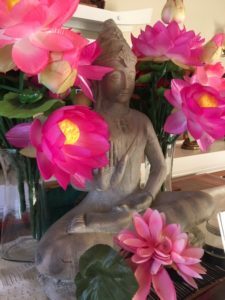 There is so much to be grateful for at Redding Zen Buddhist Priory! 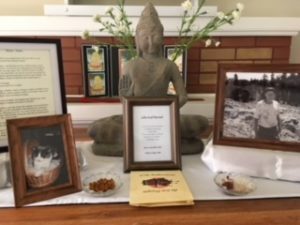 Thank you all for the many ways you have contributed to the life of Redding Zen Buddhist Priory, especially your on-going and deepening training. 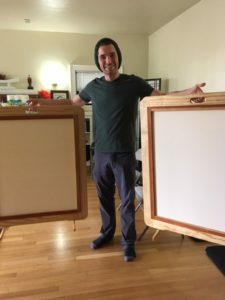 Many thanks to those who have contributed time, household necessities, food, gardening, music, office supplies, professional expertise, photography and social media support, financial support, kindness to Nicholas and Nadia, and so much more. Your support of the Priory is gratefully appreciated! This past Saturday, November 17,we had Meditation and Short Morning Service with accompaniment by one of our congregation members. It is so lovely to be able to chant all together with live accompaniment – so different from singing with a tape! 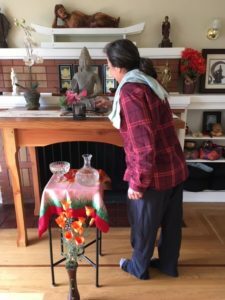 Then from 10:00 to noon14 of us had a vigorous Dharma Conversation with Beth Gong and Alice Van Geffen, long-time lay practitioners at the Berkeley Buddhist Priory. They spoke about how to train with – and at – a Priory, as well as offered perspectives on training in daily life. 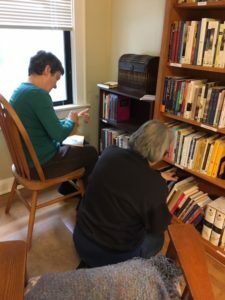 Beth and Alice have been Lay Ministers of the Order of Buddhist Contemplatives for more than 20 years. We really appreciate Beth’s and Alice’s training and generosity. We thought about taking pictures only after about half of those attending had left, but we did get some that are included below! Today we celebrated the Festival of Thanksgiving, singing How Can We Not Give Thanks? and exploring that question in our Dharma Talk and Discussion. 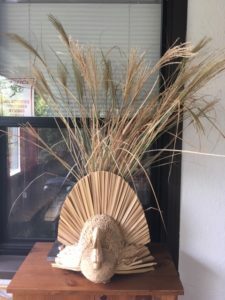 The following announcement was sent out from Shasta Abbey on Sunday, November 4: As you know, Rev. Master Chosei died this past 29th October. On behalf of the community, Rev. Master Meian wishes to invite you to his funeral ceremony, which will take place on Monday, 19th November at 10:30 A.M. in the Buddha Hall, followed by tea. 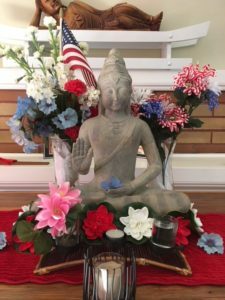 On Election Night, November 6, Redding Zen will hold a Meditation Evening, offering the merit thereof for the benefit of our country. Please come for all or part of it. Rev. 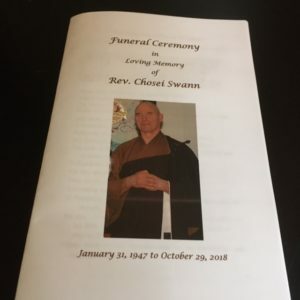 Master Chosei was a true monk, a profound teacher, and a real friend. The Priory will hold a Memorial for him after his funeral at Shasta Abbey. I’ll let you know the time of the funeral and the memorial. On Monday, October 29, Rev. Helen was celebrant for a Memorial for Mary Cherub, Patty Donahue’s 94 year old aunt, who died peacefully earlier in October. 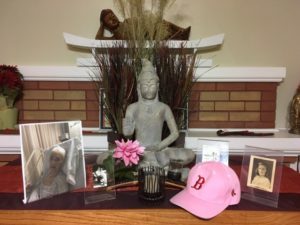 Mary was a beloved influence in Patty’s life, she was an avid Red Sox fan. Thanks to all who helped with our October 26 working meditation morning. 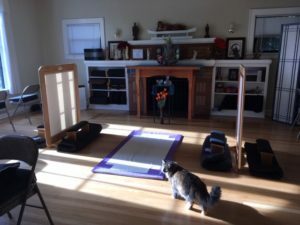 We did a deep cleaning of the Meditation Hall. 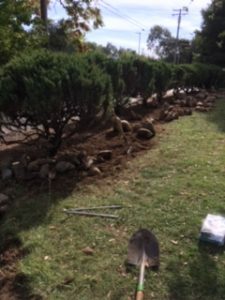 AND we did an amazing amount of work on the front lawn creating a drought-resistant, native plant garden in front of the Priory – as the pictures below show. 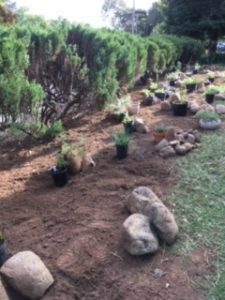 We prepared the ground for the new plants and moved the stones – and the plants in pots – into position. On Sunday the 27th we dug the holes and placed the plants in the ground. Though there’s much more planned, it looks lovely, even now. 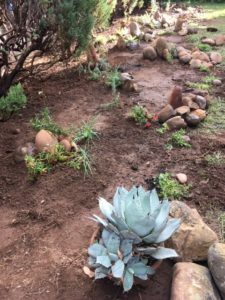 Besides saving water, these new plants will be very attractive to birds, bees and butterflies. In our Festival Memorial Ceremony for Rev. Master Jiyu today, we were grateful to have a lovely flute accompaniment to our invocation played by Scott Johnson. It is a joy to continue to honor Rev. 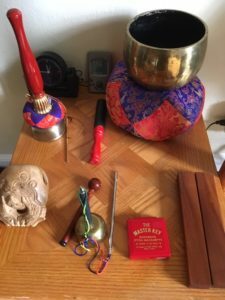 Master JIyu’s musical legacy in our ceremonies. We had a full weekend at the Priory! On Friday, October 19, Chris Carrigan and Rev. Helen went to the Native Plant Sale at Shasta College to get drought-resistant native plants that we will plant next Saturday, October 27, during the Working Meditation Morning. We will have Meditation and Short Morning Service at 8am and then have Working Meditation from 9am to noon. Please come for any or all of the morning. There is indoor working meditation opportunities as well as the outdoor landscaping project. 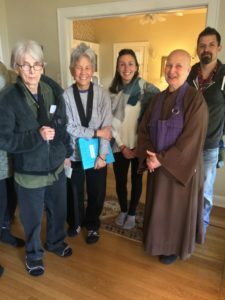 On Saturday, October 20, 8 sangha members participated in the Sanctifying the Mundane: The Ceremony of Daily Life Retreat from 9:00am to 2:00pm. It was a rich day of meditation, reflection, shared Dharma conversation and a formal meal eaten together in silence at lunch. There was time for private practice and spiritual counseling in the day’s schedule. On Sunday, October 21, 7 of us participated in Panda Ruth Jerry’s Lay Ordination Ceremony performed via Skype by Rev. 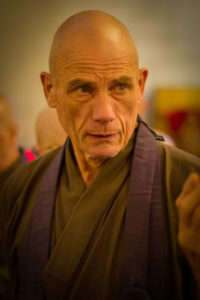 Master Koten Benson of Lions Gate Buddhist Priory, Lytton, British Columbia, Canada.. 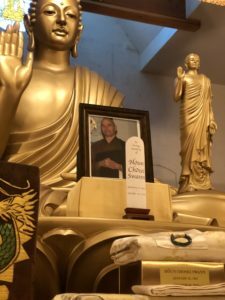 It was a deeply moving ceremony, for those who have previously taken the Precepts as well as those who might consider taking them in the future. Rev. Helen worked with Panda to prepare her for this significant step in her training. After the Ceremony, Rev. Master Koten offered a short Dharma Talk on how to keep the Precepts. As the Offertory to the Ceremony says. Now the universe rejoices, the earth trembles and the flowers fall. The Bodhisattvas of other worlds ask their Buddha what this means and the Buddha replies that a new disciple has been given the Pure Great Precepts of the Bodhisattvas…the Bodhisattvas,on hearing this explanations, bow towards you saying, ‘If this is so, you are the same as us. 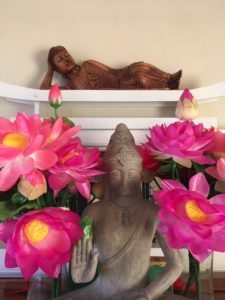 You are believing in, and taking, the Buddha for your Master and making the Bodhisattvas your friends.’ We are delighted that Panda has made this significant commitment to her practice and we offer her our sincerest congratulations. Rev. 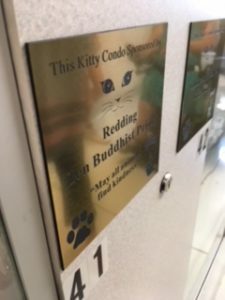 Helen addressed the 16 people participating in the six-week After the Fire: Meditation for Stress Reduction course being offered by Chris Carrigan at the Redding Public Library. It was a joy to be able to share our Serene Reflection Meditation (Soto Zen) practice of “just sitting” (shikantaza). In the 90 minute session there was time for meditation instruction, sitting meditation, walking meditation, and two vibrant question-and-answer sessions. On Thursday, August 30, 2018, Rev. 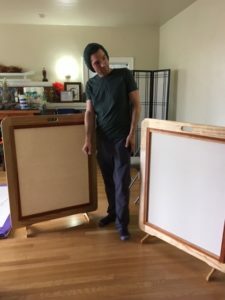 Master Astor Douglas, Guestmaster at Shasta Abbey, arrived at Redding Zen Buddhist Priory. She and Rev. Helen had a lovely walk through the McConnell Arboretuem and Botanical Gardens at Turtle Bay before sitting at the 5:30pm meditation period. 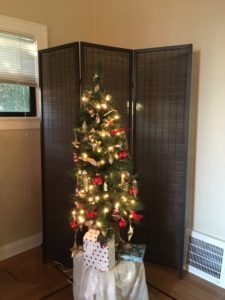 It was helpful for her to stay overnight at the Priory in order to catch a very early flight from Redding Airport. It is a joy to be able to help out Abbey monks as they travel. Thanks go the Gary Solberg who kindly drove Rev. Master Astor from the Abbey to the Priory yesterday. On Saturday, August 25, Rev. Helen was celebrant for a Memorial Ceremony for John Karl Bermel who was a victim of the Klamath Fire earlier this summer in Hornbrook, CA. Gary Solberg was Precentor, Patty Donahue was Chaplain, and Chris Carrigan was Assistant Chaplain for this gentle ceremony. The 14 of us who attended shared tea and lovely stories of John after the ceremony. We all expressed gratitude for John’s presence in the world and in our lives. On Tuesday, August 14, and Wednesday, August 15, 2018, Rev. 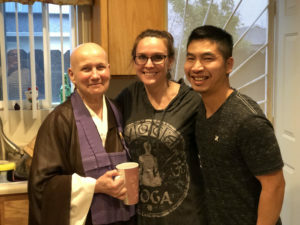 Master Seikai Luebke from Pine Mountain Buddhist Temple and Meditation Retreat visited Redding Zen Buddhist Priory, stopping overnight on his northward travels. On Friday, August 17, 2017, Rev. Veronica Snedaker stopped by for a cuppa Priory hospital on her way southward. It is a joy to welcome visiting monks of the Order even with Redding’s current overlay of smoke. 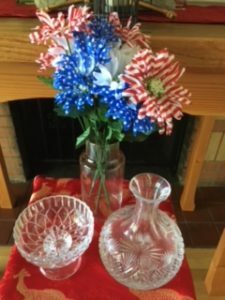 On Sunday, August 12, 2018 Rev. 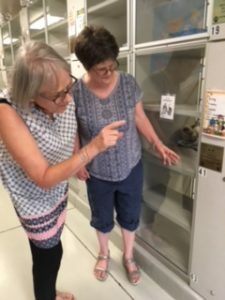 Helen returned to the Priory from New England and the kitties – Nicholas and Nadia – returned from their evacuation at Chico Hospital for Cats. Thanks so much to Dr. Elizabeth Colleran and the wonderful staff there who not only provided compassionate care for Nicholas and Nadia, but also for more than 20 other cats evacuated because of the Carr Fire. 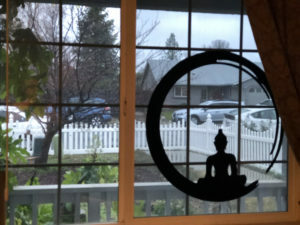 Thanks, as well, to Patty Donahue and the Redding Zen Sangha who kept the Priory building – inside and out – safe and nice. 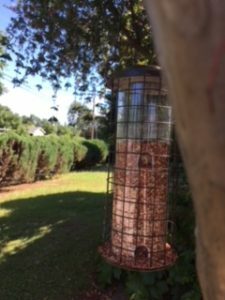 The plants are thriving, as are the birds. At the sane time we are all painfully aware that so many have lost so much over this past time, that so many firemen and first responders have done so much, and hope to have a memorial for those beings who have lost their lives later in the month. As we move into August, the Carr Fire is still dangerous but seems to be moving away from Redding. May all be able to return home soon. Thanks to all who – officially or unofficially – offered housing or refuge for animals or a listening ear or a random act of kindness during this challenging time. Please continue to offer merit for all affected by the fire, particularly the fire fighters and the first responders. It was a joy to be able to offer a stick of incense this morning at the Redding Zen Buddhist Priory altar. The Priory building is intact and for the time being the meditation schedule will be Tuesday through Friday: 6:30am and 5:30pm. 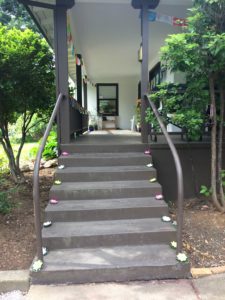 On Sunday, August 5 and Sunday, August 12, there will be meditation at 10:30am followed by a ceremony and a Sangha discussion. 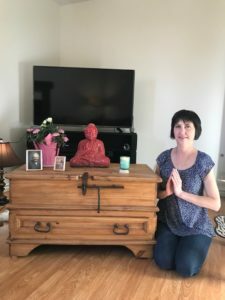 Thanks to Patty Donahue who will be staying at the Priory and for all who are supporting the life of the Redding Zen Buddhist Priory. There will NOT be a meditation period here on the first two Saturdays in August: August 4 and August 11. Nicholas and Nadia – the Priory kitties – are staying in Chico during this time. Kitties are particularly sensitive to unhealthy respiratory situations. May you all breathe deeply during this challenging time and be rooted in an awareness of our True Refuge. Om to the One who leaps beyond all fear! As of Monday afternoon, July 30, 2018, may I thank all who have supported and sent good wishes to the Priory during this challenging time. In particular, profound thanks go to Elizabeth Colleran and Hollis Elliott who gave refuge to Rev. Helen and the kitties for the past five days. Their welcoming and generous hospitality was very much appreciated. 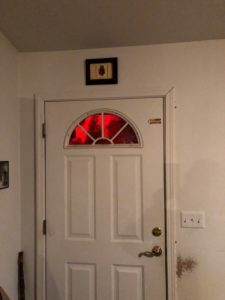 The kitties are staying with them for safety and security while Redding is facing continuing fire danger and dismal air quality. Thanks, too, to all those fighting the fire, and to those first responders who made such a difference in lives saved, both animal and human. 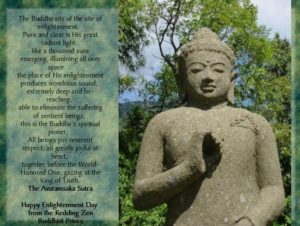 What Bodhisattvas! We pray that all affected by the Carr Fire may be safe and know true refuge. Om to the One Who leaps beyond all fear! Sponsored by the Redding Zen Buddhist Priory. May all animals find kindness. We’ll have pictures in the next while. We are grateful to be able to offer this Blessing monthly. On Tuesday, July 10, we held a Priory Movie Night. More than ten of us watched the highly recommended documentary Won’t You Be My Neighbor? 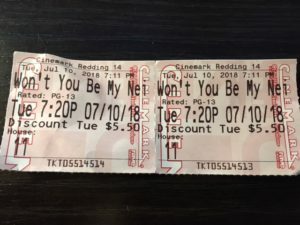 at our local movie theatre (It was “Discount Tuesday”). The film detailed the life and the impact of a truly remarkable man known simply as Mr. Rogers. We all agreed that – whether you ever watched the Mr. Roger’s Neighborhood TV show – the film is well worth seeing. We will get together at the Priory on Thursday evening from 6:00pm to 7:00pm (after our 5:30pm Meditation) to discuss the film’s relevance to our practice. Won’t You Be My Neighbor? is a New York Times Critic’s Pick and has gotten wonderful ratings and reviews https://www.nytimes.com/2018/06/06/movies/wont-you-be-my-neighbor-review-mister-rogers.html. 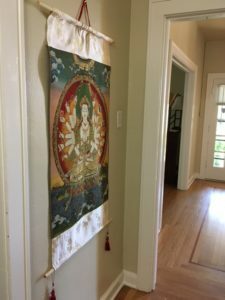 We now have a lovely thangka of a multi-armed Kanzeon hanging in the hallway. This image seems particularly appropriate for a Prory dedicated to the encouragement and support of lay practice. 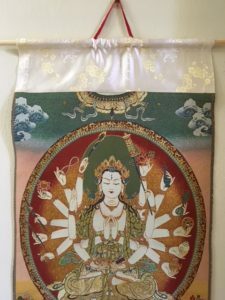 While each of the arms of this Bodhisattva of Compassion holds a tool or an object that might be used in the course of daily life – perhaps an iPad or a cell phone or chain saw or a muffin tin – her centered hands are in the Meditation Mudra pointing us to the importance of stillness in activity. Thanks to all who helped put this beautiful image together. Thanks to Rev. 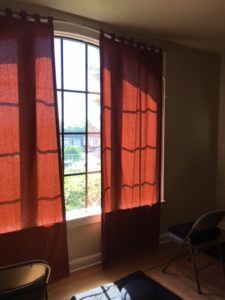 Margaret for the curtains and to John Stuart for help in putting them up in our Meditation Hall. It’s already several degrees cooler! 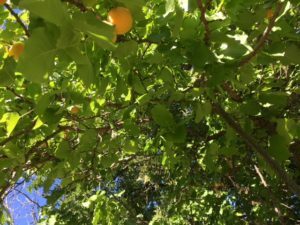 Here are pictures of the Priory lotus as well as a photo of the Priory apricot tree. The lotus has six (yes, 6!) leaves in various stages of unfolding. 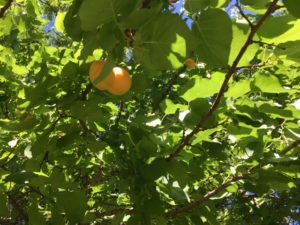 The apricot tree is full of delicious apricots that are waiting to be harvested. Please let Rev. Helen (reddingzen@gmail.com) know if you’re willing to help with the high branches. Below are pictures of our new welcoming statue that will greet you as you come up the stairs into the Priory. 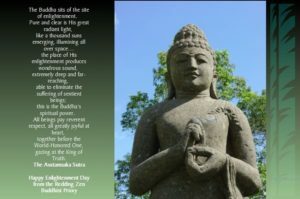 It is the Buddha in the same Abhaya – Fearlessness – Mudra as the state on the main altar. Thanks to Patty Donahue who found the lovely “distressed” box at the recent First United Methodist Church Yard Sale. 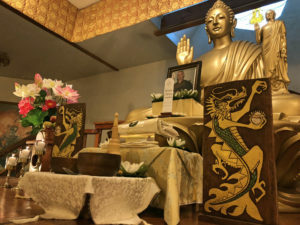 During June, our Thursday evening class – after our 5:30pm meditation period from 6:00pm to 7:00pm – will explore The Scripture of Great Wisdom – The Heart Sutra. Please click here for recommended readings. 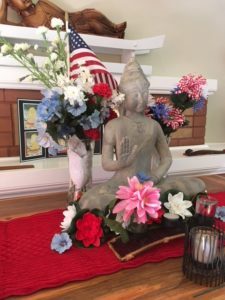 The Redding Zen Buddhist Priory wishes you a safe and enjoyable Memorial Day. 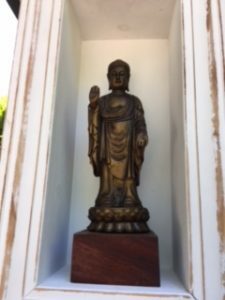 May we offer merit and metta to all those touched by war, terrorism and violence, as well as all those touched by fear. Thanks to all who helped at the Priory Working Meditation morning on May 26. 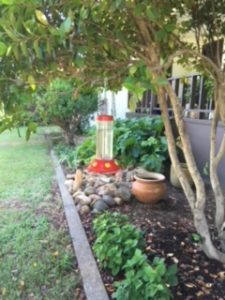 We were able to spruce up the outside yard and the porch, we did a deep cleaning in the Meditation Hall AND we filled the bird feeders – to the delight of the white-capped sparrows, the jays, the mourning doves and even the squirrels. 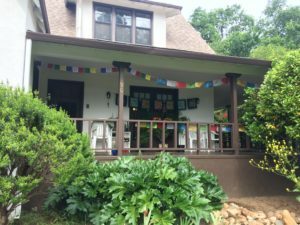 And the hummingbirds have returned now that we’ve taken down the celebratory prayer flags – which we discovered had frightened them away! 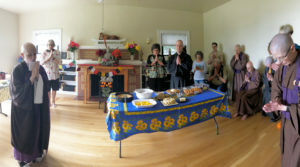 We had a good and helpful Sangha Conversation on May 24. 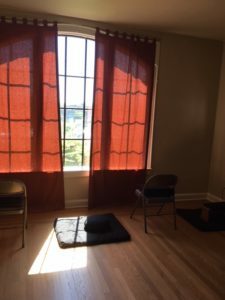 One outcome is that our evening meditation on Tuesday through Friday evenings will start at 5:30pm – hopefully making it easier for folks to come to meditation from work. Hope to see you at 5:30pm one of these evenings! 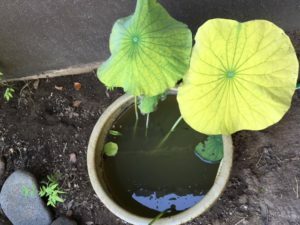 The Priory lotuses are growing! 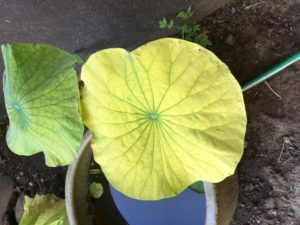 the first of them has unfolded its leaves on the surface and is now sending up aerial leaves. Members of the Sangha attended the Sikh Festival in Anderson, CA, on May 12. It was a festive celebration of Sikh religious and cultural traditions, as well as presentations in support of cross-cultural appreciation of non-violence. Rev. 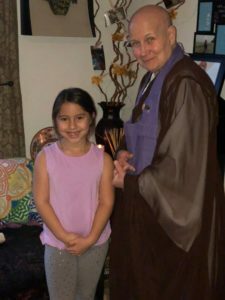 Helen was asked to give one of those presentations and she offered the Buddha’s Words on Loving Kindness (The Metta Sutra) as well as the Dedication of Merit. 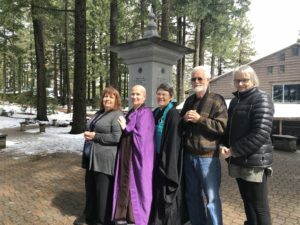 On May 5th, monks from Shasta Abbey and friends from near and far came together to bless the Priory and to offer gratitude to all who brought this temple to life. Rev. Master Meian was celebrant for the Priory Blessing Ceremony. 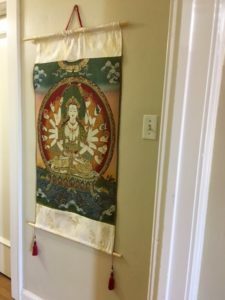 She invoked the blessings of the Buddhas and Ancestors on the Priory and its offering of the Dharma and led the more that 50 attendees through the Priory rooms and yard chanting Om Kembaya, Kembaya, Un Ba, Ta Sowaka. 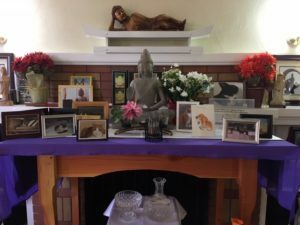 At its conclusion, members of the Redding Zen Sangha sang an Offering of Gratitude that invokes blessings and merit for all who encouraged and supported the Priory. Following the ceremonial all enjoyed a delicious and abundant potluck lunch. A good day was had by all. The Priory was decorated with flags and flowers. Thanks go to those who have tended the Priory gardens – the front lawn and bushes, the back yard, and the beautiful native plants on the porch. Rev. Master Meian was celebrant for the Priory Blessing Ceremony. Seven other monks from the Abbey came as well as Lay Ministers from Redding and Chico. 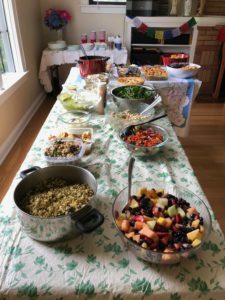 More than 50 friends of the Priory shared a delicious potluck meal and enjoyed conversations with friends old and new.